Langtang Classic Trekking | Kyanjin Gompa | Blue Poppies | Gosainkunda lake | Tamang People | Helembu. Langtang Classic Trekking:The Langtang Classic Trek provides you a chance to see the beautiful scenery of the highest peaks of the world. 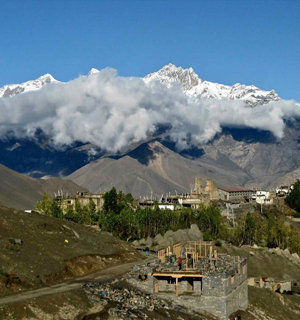 The Langtang valley is also recognized as the ''Treasure House'' of alpine vegetation. The whole valley is wrapped with a range of arresting flowers during the summer, and this scenery should by no means be missed. 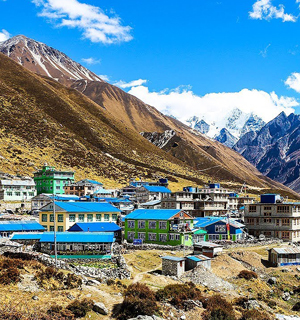 So, let Encounter Nepal design your Langtang Classic Trekking and go around some of the most breathtaking spots in Langtang region for witnessing some of the most eye-catching landscapes in the world. The Langtang Himal is geologically located in the north part outer surface of the Kathmandu valley and just near to the South of the Tibetan border. This beautiful and lush green valley of Langtang is encircled by high mountains of great fascination. The highest point in this area is Shisapangma or Gosaithan (8027m.) in Tibet. While moving from the Langtang valley to Gosaikunda, you will be captivated by diverse natural exquisiteness. This towering and remote region is occupied by Tamang people whose culture, language and way of life are alike to that of the Tibetans. During Langtang classic trekking you will pass through the community of diverse tribal groups and lush woods to the view point called Kyanjin Gompa. Also, on the way oaks, hemlock, larch and rhododendron forests captivate you. This Langtang trekking offers a chance to see the wonderful mountain of Langtang Lirung (7246m.) to the north, Gang Chhenpo (6388m.) to the south and Dorje Lhakpa (6990m.) 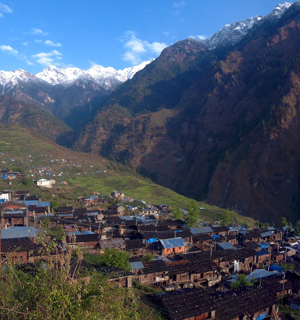 to the east overlooks the beautiful Langtang valley. Day 2 : Dhunche to Syabru Village: Trek. Day 3 : Syabru Village to Lama Hotel: Trek. Day 4 : Lama Hotel to Langtang: Trek. Day 5 : Langtang to Kyanjing Gompa (3700 m.): Trek. Day 6 : Rest day at Kyanjing Gompa: Excursion to glacier and Tserko~Ri. Day 7 : Kyanjing Gompa to Lama Hotel: Trek. Day 8 : Lama Hotel to Syabru village: Trek. Day 9 : Syabru village to Sin Gompa: Trek. Day 10 : Sin Gompa to Gosainkunda Lake (4261): Trek. Day 11 : Gosainkunda Lake to Tharepati (3605): Trek. Day 12 : Tharepati to Kutumsang (2440m): Trek. Day 13 : Kutumsang to Chisopani: Trek. Any additional services requested and tips to the staff.